The wonderful national gown for Miss Russia 2012 was made by Poulet Koenkamp, owner and creative designer of PurpleMoon. She made a wonderful interpretation of the russian traditional style for Miss Rusalka Callisto, who represented Russia in the Miss Virtual World competition for 2012 and in the end made the 3rd runner up. The textures are fantastic and you can see the incredible skills of Poulet, if you take a closer look on the fabrics. 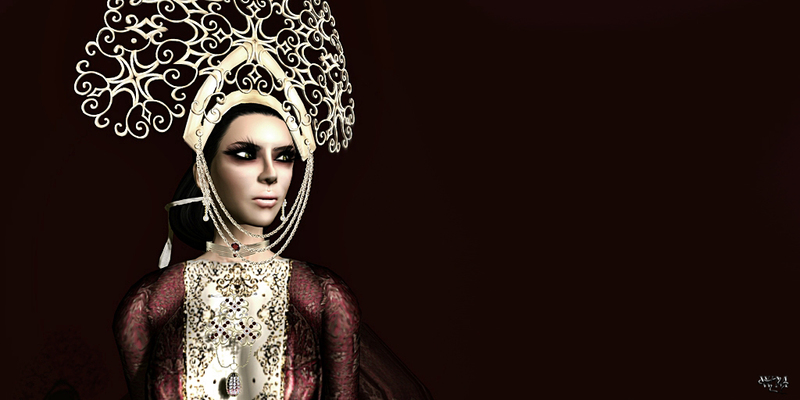 The huge headpiece as well is part of the “Catherine” gown. The wonderful ensemble is now available at the PurpleMoon Mainstore. For the jewelry Rusalka chose different already existing parts from Finesmith like the earrings and ring of the Rhonda set, the “Capri Collar” or the “Golden Nails”. As an extra special eye catcher, yula Finesmith designed a wonderful brooch to match this awesome outfit and the theme. The “Fabrege” brooch is an amazing and perfect decoration for this wonderful creation and it can found in a few more color combinations at the Finesmith Mainstore. This entry was posted in Fashion, New Releases and tagged 3D, 3D people, Aida Ewing, Art, beauty peagant, Blog, Blogger, BOSL, Challenge, Clothing, contest, Couture, Fashion, Fashion in Pixels, Female Clothing, female wear, Finesmith, Formal, formal attire, Glam Affair, Haute Couture, Headpiece, High Fashion, July Raymaker, Linn, male clothing, Manifeste, meta virtual, Miamai, Miss Russia 2012, Miss Virtual World, Model, Modeling, Monica Outlander, MVW, natioanl gown, national gown, New, New Release, New Releases, News, photographer, Pose, Poses, Poulet Koenkamp, PurpleMoon, Rusalka Callisto, Russia, Second Life, Secondlife, SL, SL Clothing, SL Fashion, SL Style, Style, Virtual World, Wicca Merlin, woman, Yula Finesmith. Bookmark the permalink.